I capture the simple everyday candid moments we experience as we go about our day. I not only look at the present but also the past. Poring over old albums provide me with inspiration from black and white photos of another time. These grainy photo references, with much loss of detail, compel me to use my imagination for recreating the scene. I interpret the moment using color pencil and pastel - feeling a nostalgic connection to that moment in the past. The scene may be of an era gone by but the ideas, thoughts and feelings are as true today as they were then. Original 9 x 12 Colored pencil artwork. Take time from your busy schedule for relaxing contemplation. Original 11 x 14 Colored pencil painting. 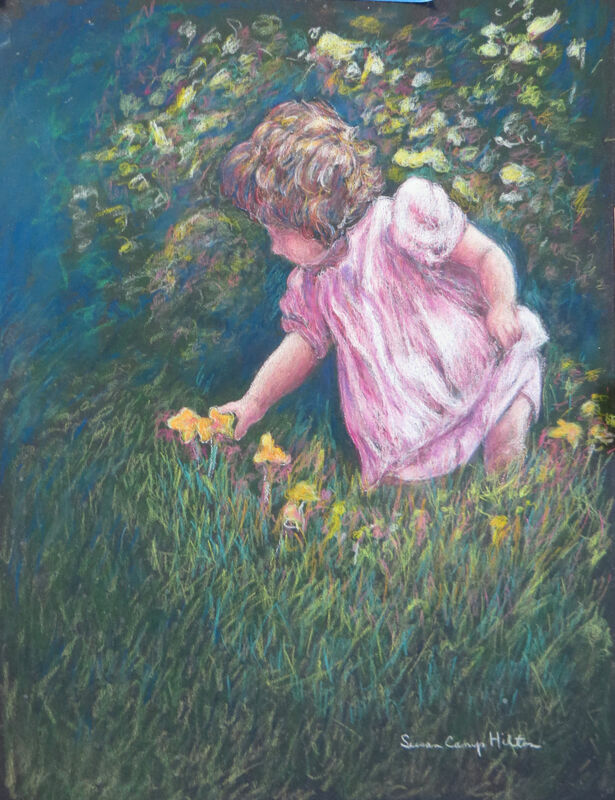 This is a giclee print of my original colored pencil and pastel artwork, "To Fetch A Pail of Water". This little girl took her small bucket to the ocean to get more water for her sand castle. There was a moment of pause as she faced the ocean waves rolling in before continuing on her quest one little bucket of water at a time. I wanted to capture the moment of her facing the ocean with her little pail.